It appears that the reason they decided to have a party on the wing, was due to a fuel leak that looked like it might be vaporous (this the “spark” comment in the title). Apparently many felt it was better to be out, standing on the wing, in the event the fuel spill turned into something, rather than in the aircraft. I don’t see the fuel spill, bu the fact that the fuel truck is in the background doesn’t make me feel like that was good idea. Oh, and check out how many bags are on that wing… looks like there is in fact room for a rollerboard on the wing, because, why not? The owners of the wing bags are complete idiots. I still have a mixed opinion on that. Mixed opinion because this situation was more urgent than emergency? I don’t know if I’m qualified to distinguish between a situation where every second counts and one where we need to get out of the plane fairly quickly, because it’ll take them 5 minutes to get a staircase over to us, but no one is going to die, because I didn’t want to have to get a new passport. 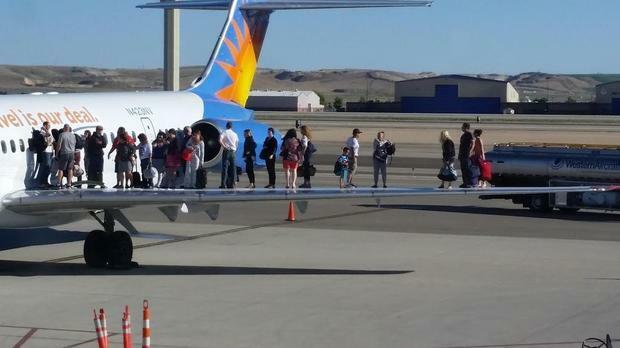 Idiot of (That) Day award goes to the guy holding a little boy’s hand, standing on the wing, rather than insisting that they be evacuated far enough away. Because, of course, when jet fuel blows, it doesn’t cut a really wide swath of destruction.